I didn’t wear them, but my dad did. This is what their winter socks used to be—what they put for their insole, inside the boots. Grass socks could be worn by themselves outdoors or inside the house. In cold or wet weather they served as comfortable liners for waterproof skin boots, in combination with wool or fur socks, grass padding, and moss. Yup’ik grass socks are similar in design. 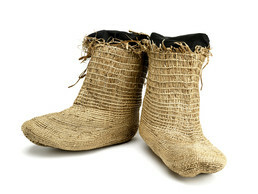 Aron Crowell: Did Unangan people make grass socks like these? Mary Bourdukofsky: Yes. I didn’t wear them, but my dad did. This is what their winter socks used to be—what they put for their insole, inside the boots. They made the waterproof [boot upper] first out of gut or esophagus of seal. My dad said then they put dry moss inside that, and then this [grass sock] in there, put it in another moss, and then their wool socks. They traded with the Russians who started bringing them wool. And it keeps their feet dry and warm. The men use it for mukluks. That’s the story my dad used to tell us. He had picture of it. My dad owned one when he was a young man, and he said his mother made them. He said she had to make them every fall for winter, because they didn’t last long. These were for their winter boots. She weaved these [socks], and then at the same time she had to make waterproof covers [boots] for these. She used the esophagus of a seal or sea lion gut [upper] and made the same shape but a little bigger, and she tried to put leather [sole] underneath that esophagus. He said before winter snow fell, they gathered a lot of moss, green moss, but it turns brown [when it dries]. And they take it home and make sure it dries. When the boot is finished, underneath they put that moss, then they shove this grass one in there, and then another moss to make sure it’s soft. Aron Crowell: Moss inside the grass sock? Mary Bourdukofsky: Yes, two layers of grass. He said the waterproof one [boot] used to be up to their knee, but this one [grass sock] could be a little shorter. And then they tied it—she had to make sure there’s a string there [along top], so the water didn’t go in. Aron Crowell: And how about the name for the socks, for these boot liners? Mary Bourdukofsky: Well in my house they called it supuug^a [grass socks] or uuleegux^ [grass socks]. (1) Supuug^a is a Russian word. Uuleegux^ is the Aleut word. Aron Crowell: Is this the same grass that you would weave baskets from? Aron Crowell: And what is the grass called? Maria Turnpaugh: Rye grass. (2) But this is not rye grass, it’s not what you weave with. Mary Bourdukofsky: Look how shiny it is. It is [rye grass]. Maria Turnpaugh: I know, but you can’t split grass that evenly. Mary Bourdukofsky: To me it’s not split grass. They used it the thickest they could get it. Daria Dirks: Yes, now I see, instead of splitting it like they do for regular baskets. Maria Turnpaugh: When I went to that basketry gathering in Ketchikan [Tlingit], I saw the same kind there as these. Mary Bourdukofsky: I think it was popular. Maria Turnpaugh: And their weave is much similar to ours, but they use the cedar bark and grass too. Aron Crowell: This something that women would weave? Aron Crowell: What about the weaving on the bottom? Mary Bourdukofsky: When they get to this [leg], they changed their weaving. The bottom is just the way you start weaving the basket. And then as they go up, their weaving gets further apart, so it makes it kind of soft, the upper part. They make the top loose, so it could kind of stretch. But the bottom part is stiff, tightly woven. 2. Rye grass is the common name for Elymus mollis. Grass “boots” or socks were worn by themselves outdoors, as mentioned in this traditional story, or more commonly, inside the house. In cold or wet weather, they served as comfortable boot liners for waterproof skin boots in combination with wool or fur socks, grass padding, and moss. (2) Yup’ik boot liners are similar in design.